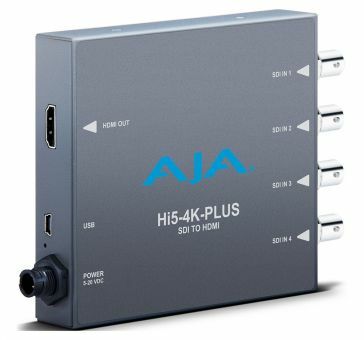 AJA’s Hi5-4K Plus preserves your vision with pristine image fidelity and HFR support up to 60p for 4K/UltraHD SDI to HDMI 2.0 conversion needs. The Hi5-4K-Plus can also generate HDR metadata in accordance with HDMI v2.0a/CTA-861.3. Hi5-4K Plus provides a simple monitoring connection from professional 4K devices using Quad 3G-SDI, Quad 1.5G-SDI, or Dual 3G-SDI outputs to new displays with HDMI 2.0 inputs, for cost-effective monitoring for 4:2:2/4:4:4 60p professional workflows. The latest generation of affordable 4K monitors utilize an HDMI 2.0 connection, which allows a full 4K signal to be passed over a single cable. Typical professional 4K workflows use four SDI cables to carry the full resolution image, making it difficult to incorporate these newer monitors. Hi5-4K Plus is an easy-to-use converter that bridges the gap between these two worlds for seamless integration. Hi5-4K Plus also supports High Frame Rate (HFR) inputs. 4K/UHD signals at 50 or 60 fps can be fed into Hi5-4K Plus and output at up to 60p for viewing with appropriate HDMI 2.0 capable displays.